Artcoustic pioneered the concept of an all in one LCR (Left, Centre and Right) soundbar as far back as 1998, and the SL version is an evolution of this classic loudspeaker. The Multi Soundbar 1449 SL can be used as a single LCR loudspeaker, or for more powerful systems, used as a single mono centre channel. The standard sizes are designed to complement today's flat screens. Bespoke width options are also available. 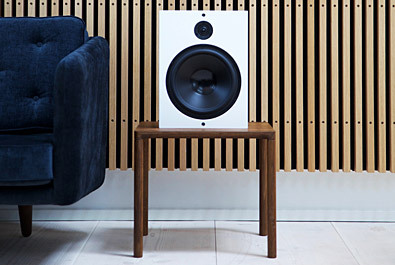 To create incredible loudspeakers you need incredible components, and Artcoustic carefully selects the finest around, using only the highest quality drivers hand picked from Danish suppliers for the ultimate in sound reproduction. In order to achieve the highest quality possible, high grade copper coils and bypass capacitors are employed in all models, and non-inductive resistors are used throughout. No detail has been overlooked to deliver the finest loudspeakers possible with no compromise in performance. However, speakers of this quality are not just about high quality component parts. What sets Artcoustic loudspeakers apart is the workmanship and sheer artistry with which it has been brought together. Artcoustic has ensured that the original designs are delivered with care, attention, passion and pride. Each unit is painstakingly constructed by hand. No manufacturing line, no robots, but a team of dedicated craftsmen. Every loudspeaker is inspected visually and technically to ensure all products leaving the factory are deserving of the Artcoustic name. Operating Range: 65 Hz to 40 KHz. Dimensions: H: 120 x W: 1449 x D: 67 mm. Artcoustic provides a canvas like no other, allowing you to create your own unique style. Artcoustic take care of the refined form, quality and performance, the look is up to you. In a few simple steps you can personalise your loudspeakers to suit your interior. Choose from an unlimited selection of colours for the cabinet, a matching coloured screen or a digitally printed artwork, chosen from our gallery or your own designs. The Multi Soundbar 1449 SL is available in standard black or white and includes matching screens, which are interchangeable using a magnetic mount. Discover the Artcoustic speaker range and find out why they are the perfect match for your property.